Bognor bosses were pleased with the success of Pompey’s annual visit - on and off the pitch. The Blues won 2-0 but most felt the Rocks had given them their toughest pre-season test to date, a week after Kenny Jackett’s side had won 6-0 at Havant. Coach Darin Killpartrick felt the Rocks did well to contain Pompey for long periods, beaten only by early and late strikes by Brett Pitman. 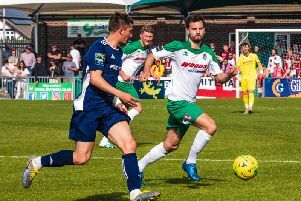 And with a crowd estimated to be 1,800 packing into the ground, it was also an important payday for Bognor ahead of their National League South campaign.